I am a huge horror fan. However, after a week of watching Andy Muschietti's IT, Darren Aronofsky's Requiem For A Dream and Adam Wingard's Death Note, I am feeling pretty wrung out emotionally. At times like these, I need the movie equivalent of a cosy blanket and a mug of hot chocolate. A film far from horror. A restorative movie guaranteed to make me smile. This started me thinking. What are my go to 'happy' movies? Those films that guarantee a few hours of smile-inducing escapism? Of course many titles could fit this bill. However, here, I have decided to narrow things down to an emergency list of (in no particular order) ten. Ah, how I love this classic sci-fi spoof. If you haven't seen it, the movie follows the cast of a recently cancelled show, Galaxy Quest, after they are mistaken for real astronauts by an alien race (called the Thermians). What really makes me smile every time I watch this film is Alan Rickman’s brilliant performance as Alexander Dane. By Grabthar’s hammer he’s just so good... and very much missed. I struggled to pick a Bill Murray film for this list… there are just so many choose from. However, on balance, the wonderful live, sleep, repeat classic, Groundhog Day, makes me smile the most. Ned Ryerson… need I say more? I always watch Taika Waititi’s film, Hunt For The Wilderpeople, with a huge grin on my face. It is heartwarming, utterly charming and laugh out loud funny. A proven cure for the darkest of days. Herbert Ross’ 1989 film, Steel Magnolias, is a classic weepie. However, let us not forget that the first half of this movie is brilliantly funny thanks to a whip smart script and the wonderful dynamic between the close knit group of friends. Laughter through tears is one of my favourite emotions too, Truvy. Of all the many Charlie Chaplin films that make me smile, City Lights is my favourite. Here we follow the little tramp as he falls love with a blind flower seller (Virginia Cherrill) and goes to great (and often hilarious) lengths to make his fortune in order to be worthy of her affection. The late and great film critic, Roger Ebert, wrote that “films like Fargo are why I love the movies”. I wholeheartedly agree. This Coen brothers classic is brutally violent but also extremely funny. However, it is Frances McDormand’s Oscar-winning portrayal of Marge that always makes me smile. I adore Broadcast News for so many reasons and the brilliantly funny interplay between Jane (Holly Hunter), Tom (William Hurt) and Aaron (Albert Brooks) is one of them. (I also love the wonderful physical comedy from Joan Cussack). Brooks, however, gets the film’s funniest lines. What do you do when your real life exceeds your dreams? Keep it to yourself. Of course Tom Hanks had to make an appearance in this list! Just hearing his voice makes me feel better. Penny Marshall’s Big is a smile-inducing joy (the slightly queasy relationship between Josh and Susan aside). It is just wonderful to watch Hanks work his magic. Rob Reiner’s 1987 classic is the perfect family film. Full of adventure, romance and featuring a truly sublime cast, The Princess Bride is laugh out loud funny from start to finish. One of my very favourite films, I always watch When Harry Met Sally with a smile. I love the way Harry reads and how Sally orders food. I love Surrey With A Fringe On Top in front of Ira and how Baby Fishmouth is not sweeping the nation. Perhaps not everyone can have good taste and a sense of humour, but Nora Ephron certainly did. What Films Make You Smile? 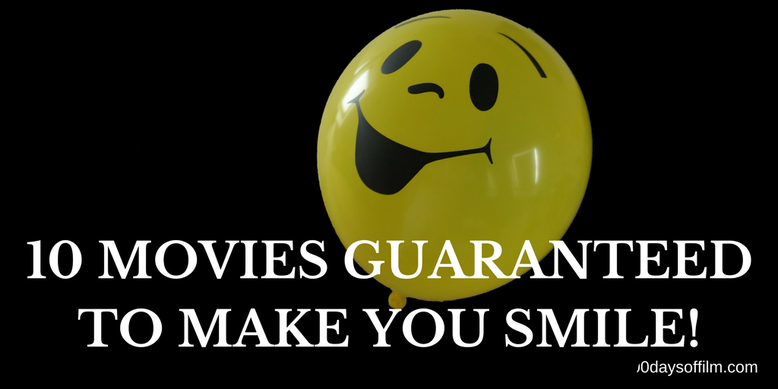 What films are guaranteed to make you smile? Do take a moment to share them with me in the comments section below or let me know all about your smile-inducing movie recommendations over on Facebook or Twitter (@500DaysOfFilm)!